Growing Conditions: acidic, well-drained soil. Typically DOES NOT thrive, for any length of time, in the Northeast or other high summer humidity areas. 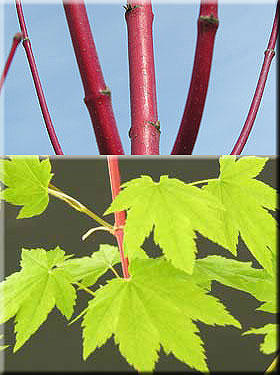 Comments: It's a hot vine maple...a real “wow” plant! Acer circinatum 'Pacific Fire's blazing red bark displays a waxy sheen that literally glows in the winter landscape, putting most of the other “red barks” to shame. During the spring and summer, fiery twigs and branches peek through large yellow-green leaves and in autumn, brilliant yellow foliage accentuates the contrast all the more. Like the native species, growth habit tends to be multi-stemmed, but it can also be trained as a single trunk specimen. Vine maples thrive in a wide range of soil types and once established, are quite tolerant of dry summers. Morning sun and some afternoon shade will bring out the best fall color.